One thing more relaxing than being on a beach is staying there. With the ocean breeze and a cold drink in hand, along with the calming sounds of the ocean… It might sound like some kind of expensive dream that you stick on your impossible bucket list – but it really isn’t. 12 super unique boutique hotels in Phuket none can resist! Some of these rooms even have their own private pools or two! All of them are insta-worthy, and are just a few steps away from the beach. We’ve done the work for you, and pulled up 9 of the best beachfront rooms in all of Phuket! Each have their own quirks – so find one that speaks to you and take that plunge! Modern doesn’t even begin to cut it. Aleenta has truly outdone themselves with the architecture and layout of their resort. Their rooms all come with their own private pools, but the Pool Suite definitely takes the cake. It has a bit of a Los Angeles vibe to it, with its modern design and airy floor to ceiling glass walls. Step out of the Pool Suite and you’ll find a semi outdoor sunken tub for (semi) private soaks. Next, get out of the tub take 2 steps forward, and you can jump into your private pool! When done, you can simply continue walking forward to the beach that’s waiting ahead. What better way to wrap up a fun and relaxing day, than being lulled to sleep by the sound of crashing waves? To top it all of, the views here is a beautiful panoramic scene of the beach. PS: If a dip is something you’re craving for, the lights in Aleenta’s infinity pool is nothing short of magical – if you get a photo taken from the right angle, it might even look as though you were swimming in the stars. The private and unspoilt Nakalay Beach is only 3 steps away from Thavorn Beach Village’s Beachfront Cottage. A little private villa styled in a minimalist mixture of Thai contemporary and colonial architecture designs – it’s a pretty picture made even prettier with clear skies and sapphire seas. The cottages also come fitted with semi outdoor tropical showers. The resort also boasts one of the largest free form lagoons in South East Asia. It truly is a blue lagoon paradise. When you want a dose of nightlife, you’ll be glad to take the free shuttle to Patong for parties and eats! Crashing waves at your doorstep, sounds like our ideal home. But if you can’t make it forever, at least you can have the experience! Check out the 2 Bedroom Pool Villa, it has not just one but two private pools! It’s very much like a cosy and luxurious beachfront cabin that’ll make for great memories – and you’ll love the views of the ocean right from your bed. The villa is set up with a separate deck with lounge chairs. You’ll also have access to your own rainwater shower, a spa bath and complimentary coffee! You just need to get the espresso machine going. You’ll also be a short few minutes drive away from attractions like Phuket FantaSea and Kamala Village. But why would you want to leave this beautiful place? If you are looking for a quiet retreat with your loved one in Phuket, you can’t miss Andaman White Beach Resort, which is privately nestled on a secluded white sand beach with endless views of the Andaman sea. Perfect for your honeymoon or your anniversary! What can be more refreshing than enjoying a morning soak in the luxurious oceanfront main pool? If you aren’t a morning person, simply roll out of bed whenever you want and watch the waves crash against the shore right outside your bedroom. They say watching the sea is therapeutic, and we can’t disagree! After breakfast (or brunch) in bed, step out onto the soft white sand and spend the day chilling on the sunbed (under the shelter if you don’t want to be directly under the midday sun!). And how can you not enjoy the romantic sunset from your pool with a cocktail or two? This is the perfect setting to have a long-awaited heart-to-heart chat with your partner. Dinner is either a Thai or international affair at Tom Yam Thai Restaurant or Mareblu Restaurant respectively. But if you don’t want to venture too far from the sea, you don’t have to! Why not dine at the open-air oceanfront Coconut Bar and Terrace that’s merely steps away from the sand? Yes, you know you’ve just found heaven on earth. Greeted with a drink at reception, a playground for the kids and a tennis court for the adults. It’s exactly like what a country club might be if it were transformed into a resort! The Premier Seaview with Terrace is charming, with a windowbed overlooking the sparkling oceans. Decorated in modern Thai accents, you will feel like you’ve been transported into a dream. There’s a sunken bathtub for some great soaks, but the best part has to be the beach that’s waiting just outside. It’s no surprise that plenty of people come here to tie the knot. Beauty is just waiting for you around every corner of this resort! And on the plus side, you will be treated to complimentary shuttles to and from Laguna, including ferry rides. For those who crave open living, you can get it right here at The Vijitt Resort Phuket. The Deluxe Beachfront Villa apart from being right on the beach, has high ceilings, with full length windows to boot! Aside from a private terrace from which you can enjoy the view, you also get…. Your own outdoor shower where you can see the stars. If you’re shy, you can head in and soak in the bathtub instead. The resort is upscale and dotted with palm trees and thatched roofs, and the place is richly decorated with teak wood furnishing. It is the perfect location to be based for those who’re longing to plan island day trips – with their free shuttle buses than run to and from Phuket town. When you’re spent, don’t forget to go for a nice relaxing dip in the beach-facing infinity pool! Or, there’s always the option of the private pool overlooking lush greenery. Panwan Boutique Beach Resort have their Beachfront Deluxe Rooms right by the water and overlooking lovely sunsets. If you can bear to leave the simple and elegant room, walk right out to the beach. Depending on the tide, the beach can be rocky, stretching on forever or filled with clear water. Otherwise, spoil yourself with a private dinner on the scenic beach. It really is quite amazing, the food delicious and the settings plain romantic. If you’re looking for more, try to find the large swing on the beach and hop into the resort’s jacuzzi with a view! Feeling adventurous? Consider renting a motorcycle – you can take a short ride to the local shops five minutes away or go an extra five to the aquarium. The word Marriott is a promise of standard. With flat screen TVs and private balconies, each room also comes fitted with a distinct view. At this particular Marriott hotel though, our favourite room has to be the Premier Beachfront – with its doors that open out to pearly white sands of the beach. It’s spacious and luxuriously fitted with elegant furnishings, not to mention the ensuite bathtub. When here, you can enjoy the private beach to the fullest! There’s also the option of chilling under ivory canopies overlooking the ocean, as you sip on a nice cold drink. There’s also the huge swimming pool, a fun recreation room, and plenty other things to do here. PS: A complimentary shuttle to Patong Beach is available for those looking to get into the center of everything. You’ll find places to eat, Jungceylon Mall, and nightlife here too. This is a paradise for four. Large and luxurious with 2 bedrooms, a kitchen, living area, private terrace and private pool – you’ll be spoilt to no end. The comfy and large communal areas and private infinity pool with the ocean sky as your view… Sounds utterly relaxing. 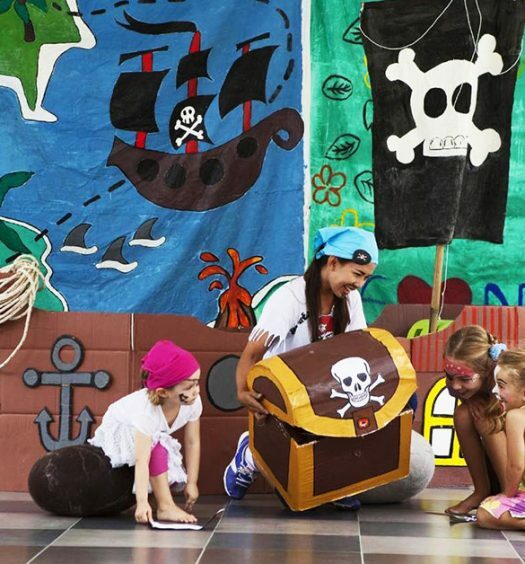 Spend days on the beach relaxing, playing and exploring, it’s just steps ahead of your villa. All you need is a Malibu Sunset in your hand and an actual sunset in front of you to complete the picture. Situated off the east coast of Phuket, the hotel has a private water taxi that will ferry you to the resort and back to the main Phuket island (a 5 minute boat ride away). There’s a range of activities you can do right at the resort, such as fun watersports like Topaz Dinghies, Paddle Boarding and Windsurfing – so you might not want to leave! (If you prefer to keep fun on land, try your hands at Muay Thai or mountain biking. Trust us, you’ll be spoilt for choice at The Village Coconut Island Phuket, and never run out of things to do. If remote is synonymous with your idea of a getaway, look no further than Serenity Resort. You can bring along some friends and make it a private party in their 2 Bedroom Pool Residence. A private infinity pool looking out over the ocean, and stairs beside your pool leading down to the beach – how lovely does that sound. That’s what you’ll get at the 2 Bedroom Pool Residence! The exterior of the resort is all about clean lines and a minimalist design. The rooms have a certain homey luxe touch to them, with welcoming warm colors. They offer BBQ services which you can enjoy right there by the beach at their signature restaurant. If you’re craving a drink, there’s a beachside bar to check into. 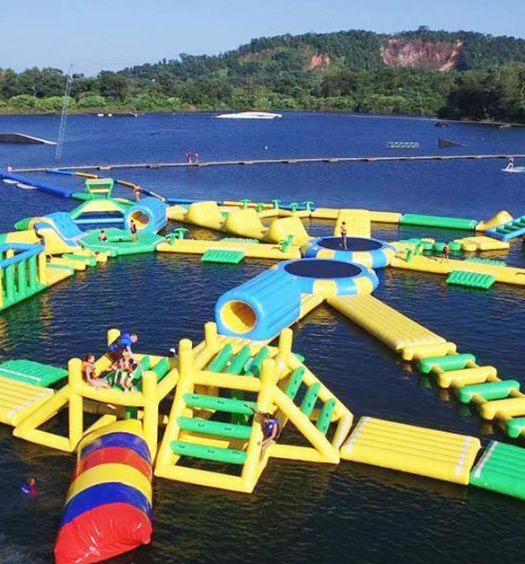 Otherwise, you can race your friends on the water with a couple canoes or go biking! But we’d lie in the shallows and let the waves rock us, as we soak up the last rays of the sun. While not in Phuket, GLOW Elixir Koh Yao Yai deserves a special mention. 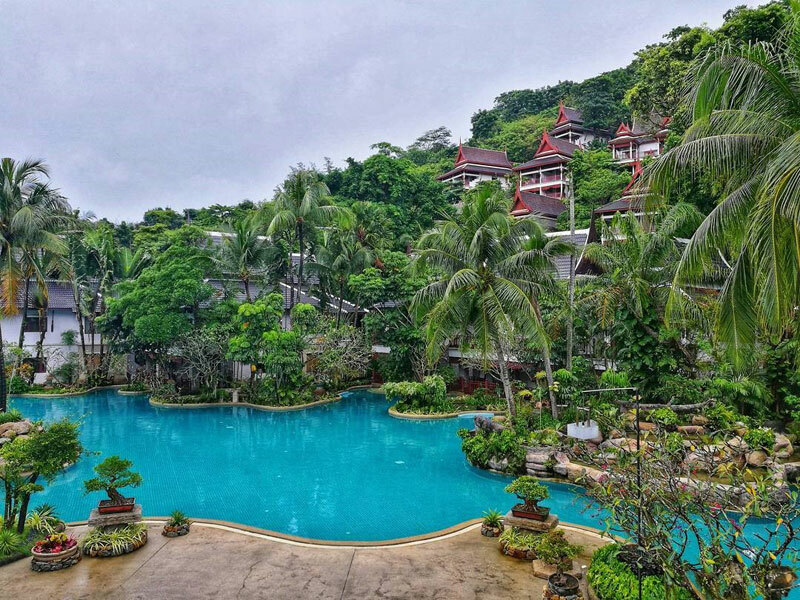 Touted as ‘The Natural Side of Phuket’, the resort is surrounded by evergreen trees and well maintained shrubbery. The villas are all standalone, with a healthy distance away from each other to give you that sense of community without being intrusive. Featuring fine carpentry, the resort is constructed with wooden structures that give it character and does not contrast with the nature surrounding it. There’s a private pool right outside your bedroom that opens up to the private beach, a lovely bathtub for intimate soaks inside, and simple yet luxe Thai furnishings. On site, you’ll also find a poolside bar, swimming pool, restaurants and more. Go solo or with a partner, we promise you’ll go home with peace on your mind. 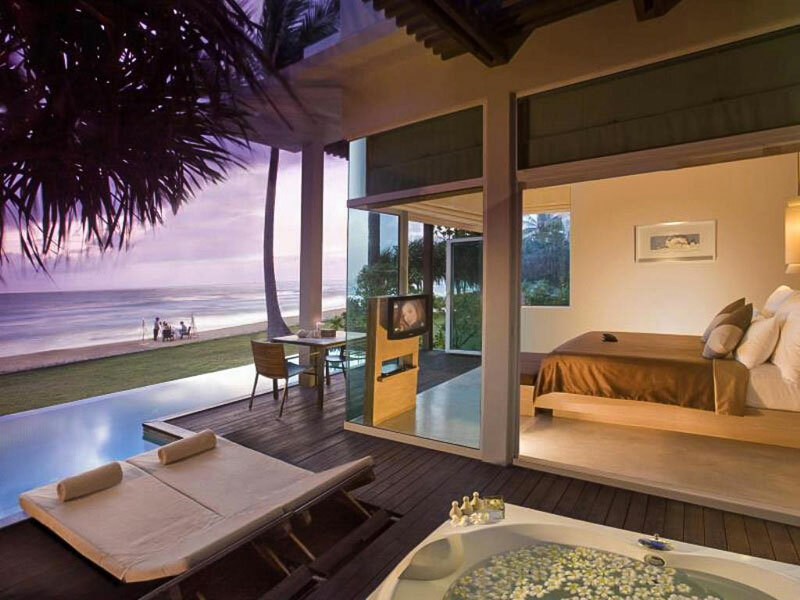 See what we meant by true beachfront rooms? Walk right to the beach from your room – now this is the best type of beach vacay!